Due to diary commitments Arnold Schwarzenegger has pulled out of the keynote speech on the first day of party conference. His spokesman said he could no longer make it to the UK in person so would be giving a shorter video-link speech instead, as Sarkozy did last year. Seeing as he does head up one of the top ten biggest economies in the world I think we can forgive him, he’s also cancelled a trade mission to India. California became the first state in the US to impose a mandatory cap on greenhouse gas emissions under his governorship, and his liberal approach to abortion and guns make him one of the more acceptable Republicans in the eyes of some in the party. 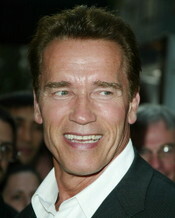 Arnie, who has described Blair as a "real action hero", said that he thought Cameron was an outstanding leader and that he was very disappointed at not being able to attend. I was hoping to lace at least one catchphrase into this post but CCHQ beat me to it: "he’ll be back". In the meantime, which famous person would you pick to make a full speech in his place?